It’s a true Fourth of July dilemma: you want to make an incredible treat to celebrate American independence, but the July heat is so intense you can’t bear the thought of turning on your oven. 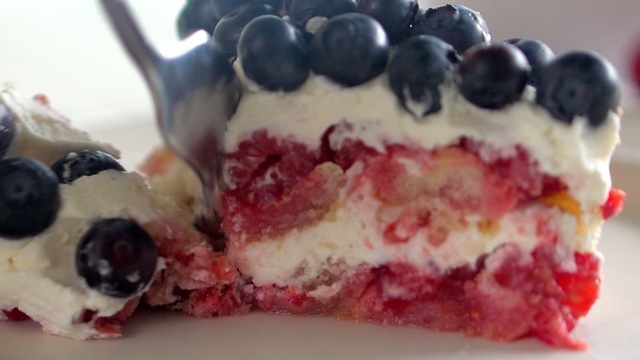 Luckily for all of us, we’ve found the perfect solution— Red White and Blue Trifle! This light and sweet no-bake dessert is filled with incredible layers of ladyfingers, cream, mascarpone cheese, and berries in all the most patriotic colors. It’s easy, picture-perfect, and the ideal treat for Independence Day. Watch how it’s made, then bring it along to the cook-out. In a large mixing bowl, stir together the raspberries, ¼ cup of the powdered sugar and the orange juice. Mash some of the berries lightly with a fork to release the juice. Set aside while you make the filling. In a large bowl, whip the mascarpone cheese and ½ cup of the remaining powdered sugar together with a hand mixer, until light and fluffy. Pour in the cream and vanilla extract. Whip with the hand mixer, gradually increasing the speed to high as the cream thickens, until soft peaks form. Spray a 9-inch springform pan with nonstick spray. Line it with round piece of parchment paper on the bottom and strips of parchment around the sides of the pan. Line the bottom of the pan with the broken lady fingers, trying to fill any gaps with smaller pieces. Spoon half of the raspberry mixture evenly over the lady fingers, then top with half of the mascarpone cream. Spread it evenly to the edges of the pan, then repeat with a layer of lady fingers, the rest of the raspberries, and the remaining mascarpone cream. Top the cream with the blueberries. Refrigerate for 6 hours or overnight, until the ladyfingers have softened. Yes, you really do need to spray and line the springform pan with parchment paper. This way, the layers won’t stick to the sides when you release it!